Star Wars Episode III: Revenge of the Sith is the latest Star Wars epic from Lucasarts that delivers the player into the turbulent world of the yet to be released episode 3. Impulsegamer was given strict guidelines by Electronic Arts not to publish this review until the 5th May because this game mimics the movie, so I must advise reader discretion. With that said, this game is probably one of the best Star Wars games to date which truly immerses the gamer into the Star Wars universe in this exciting third-person action/adventure game that allows the player to experience true Jedi action as either Anakin Skywalker or Obi-Wan Kenobi. The game also contains around fifteen minutes of actual footage from the third movie that nicely melds with the in-game graphics and pre-rendered CGI cinematics of this amazing title. For those readers that are still reading whom haven’t been scared off from the spoiler warnings, the game revolves around the current storyline of Star Wars Episode III: Revenge of the Sith which finally pieces together the fall of the Republic and the rise of the Imperial order under Chancellor Palpatine, the Emperor. After three years of fighting, the Clone Wars are finally reaching an end and when the Jedi Council dispatches Obi-Wan Keboni to destroy General Grievous, the deadly leader of the Separatist droid army, Anakin Skywalker is tempted by Chancellor Palpatine who reveals the true nature of his plans and the powers of the dark side. However, for Chancellor Palpatine to succeed, he must enlist the aid Anakin Skywalker (the Jedi named as the one in ancient prophecy) to help decimate the Jedi Council to bring a new order to the galaxy. Unfortunately for the Jedi Council, this insidious plan is discovered too late and in an attempt to stop Anakin, Obi-Wan valiantly battles the new Sith Lord on the world of Mustafar, a planet of fire and lava. Fortunately for the forces of good, they are offered a short reprieve as Anakin is severely injured in the battle. His broken body is taken by the Imperials who under orders by the Emperor, is finally turned into Lord Darth Vader, a Dark Lord of the Sith. And that my dear gamers is where this title takes place! 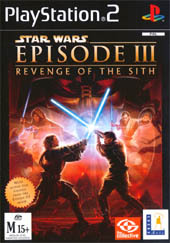 The storyline of Revenge of the Sith is memorably narrated through the eyes of Anakin Skywalker and also that of Obi-Wan Kenobi but players only control these characters at certain points in the game. The developers have done a brilliant job at not only keeping the storyline accurate and entertaining but also giving the gamer the freedom to play both these integral characters to the Star Wars mythos. Clearly my most enjoyable character in the game was that of Anakin Skywalker who starts the game as a troubled Jedi and slowly slides towards the Dark Side of the force as he heeds the preaching of the Emperor. As mentioned earlier in the review, the players gets to play the title in a third person mode that allows the gamer to easily interact with the gaming universe. Apart from finding and using objects, running, jumping and attacking enemies, the gamer must also master the force system of the game that really takes this game to the next evolutionary stage of gaming of entertainment and realism. 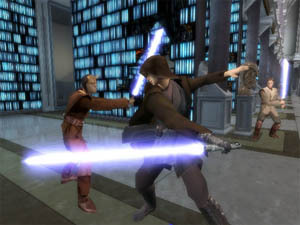 The gameplay of Revenge of the Sith also features a traditional mission based style of play that lets the gamer fight their way through 16 unique and different levels. Although the majority of levels are taken directly from the third film, there are also some new locations that have been inspired by the film. The missions are generally rather straightforward that require the player to perform a variety of different objectives in order to successfully proceed to the next level or character. However by completing certain objects in the mission, the game rewards the player by unlocking new gameplay modes, missions, co-op modes and also various characters from the Star Wars universe that include Count Dooku, Mace Windo and newcomer General Grievous to name a few. Although the game is aimed at the single player market with the main storyline, there is also an exciting multiplayer mode that allows players to challenge their friends in some of the most exciting lightsabre duels to ever grace a game. Although Anakin was my personal favourite character in the main mode of play, General Grievous is clearly a winner in the multiplayer modes with his duel lightsaber wielding and his deadly mechanical body. In order to increase your force powers and your skills in the game, you are awarded experience points that can also be used to increase your powers, thus letting you become a Jedi Master. The combat system of Revenge of the Sith features a myriad of maneuvers that include force powers, awesome combination attacks and some of the most impressive melee lightsabre combos that will leave players craving for more. The developers have also used the Sony DualShock controller to their advantage as even the most novice of gamers can easily pull off these combos by using the d-pad and analog stick. For instance, a basic combo attack may involve pressing the square button three times or by pressing circle, square and using the analog stick to let your lightsabre do the walking. 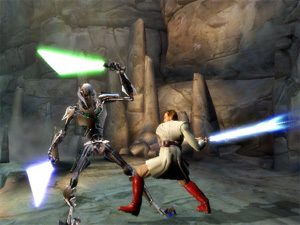 Although both characters have similar moves, players will soon notice a different combat system for each character as they progress through the game as Anakin literally unleashes devastating force attacks with his dark powers, whereas Obi-Wan’s powers are more defensive in nature. Some of the force powers that players have access to, include push, throw, sabre combos and the impressive force shield. Graphically, Star Wars Episode III: Revenge of the Sith is a visual treat on the PlayStation 2 that truly pushes the console to its limits with its lush graphical environments and highly detailed character models. From the first opening sequence of the game, players are immediately in for a treat as they become part of the Star Wars universe. The gaming locations in the game are extremely detailed and actually look like the real locations from the movie itself. All the character models have an extremely high polygon count for that added realism and match that with some realistic texture details and when you see Anakin or Obi-Wan, you could almost be mistaken in thinking that they are the actual actors themselves. The realistic movements of each character in this title have been inspired by the stunt coordinator for the movie which really helps achieve a new level of gaming masterpiece from the almost human-like movements of all the characters. However, the most impressive features of the graphics are the special effects that can be discovered in every nook and cranny of the game, whether it’s the realistic lighting effects of the lightsabres or the amazing special effects of the force powers, everything flawlessly melds with the gaming environment. The only downside to the graphics is that sometimes the camera angles are a little fiddlesome but fortunately it's nothing too drastic to interfere with the gameplay. The musical score of the Revenge of the Sith is brilliant and features some of the original music by John Williams that truly helps immerse you into the amazing Star Wars universe created by George Lucas and one cannot help but hum away to the musical score. The game also contains some exceptional voice acting that has been performed by some of the actors of the Clone Wars cartoon series. It would have been nice if the game featured the voices of the actors from the movies but it’s a small price to pay for an exceptional game. With that said, the game also contains a plethora of Star Wars sounding sound effects such as the hum of the lightsabre that truly sends shivers down your back. In conclusion, if you are a Star Wars fan or not, this game has something for everyone, whether it’s the exceptional storyline, the sturdy gaming engine or the amazing graphics, Star Wars Episode III: Revenge of the Sith is a true masterpiece of the 21st century. It should be also noted that the replay value of this title is also quite high because even if you have completed the title, there will be dozens of things you have missed the first time around and also a plethora of unlockable gameplay modes and characters. Highly Recommended!